Generally, there is tank and tankless water heater types and you can go ahead and choose solar, gas or electric powered. All these options will have different cost ranges due to features and effectiveness. A tankless water heater is more expensive than a tank water heater because it occupies less space and saves energy. If you’ve to change your source of energy, you will have to incur a higher replacement cost affecting the total cost. Location can determine labor required and accessibility. Water heaters that are easily accessible have lower replacement costs unlike those that are in inaccessible places. In addition, where the water heater is can determine the number of people needed, time required and equipment. This could be a factor to alter the total replacement cost. Sometimes you need to get permits from relevant authorities making replacement cost vary from one place to another. The total cost of the permit may rely on whether you need an onsite inspection or whether there are any changes or upgrades needed in electrical, water or gas lines in your home. If you need an inspection and upgrade of the plumbing lines, you will end up spending more money. 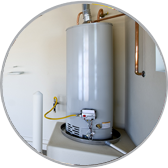 You may also include other costs that may affect the total water heater replacement in San Tan Valley, AZ cost even though they are not included in your budget. For instance, insulating the water heater or plumbing lines may not be included in your budget but you may need the services. Therefore, don’t limit yourself to the budget because there may be additional costs e.g. transport, disposing the old water heater etc.